To create a double bordered background you will want to mirror your chosen graphic and make both graphics with transparent backgrounds. Open the graphic you wish to use as your borders in PSP. Click on Image on the File menu and then choose mirror, you should now have two mirrored graphics similar to the ones below. On the file menu choose Image, then Image Information and take note of the width of your graphics. You only need this information when creating your page. The width of my graphics is 144 pixels. If the background of your graphics is the same as the background color you wish to use for your plain background you can just save the two graphics otherwise continue with the next step. Once copied to Animation Shop Click on Animation in the File menu and choose replace color. 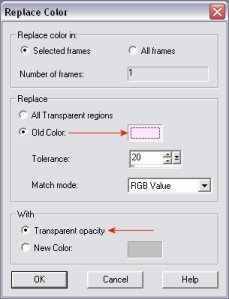 Click on the background color of your graphic which will change the selected color on the color chart. Repeat the procedure for the second graphic. When done you should have two graphics with transparent backgrounds like below. Your two graphics are now ready to be saved and you can build your double bordered background page.